On our third summer of refusing to leave Newfoundland for holidays, we were starting to focus on areas we have never seen, alternated with favourite places and, due to their abundance this year, hundreds of icebergs. 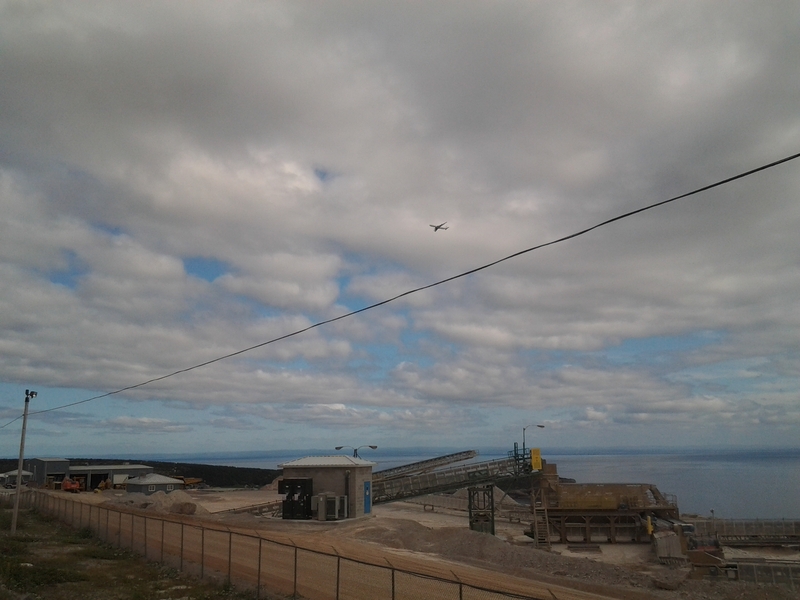 Port au Port was a new destination. Unlike the English and Irish dominance in the composition of most Newfoundland outport populations, this area was and is strongly of French and Native culture. Community names are often posted in English and French and the flag of the Franco Terre-Neuviennes was evident as were the colours of the French flag. 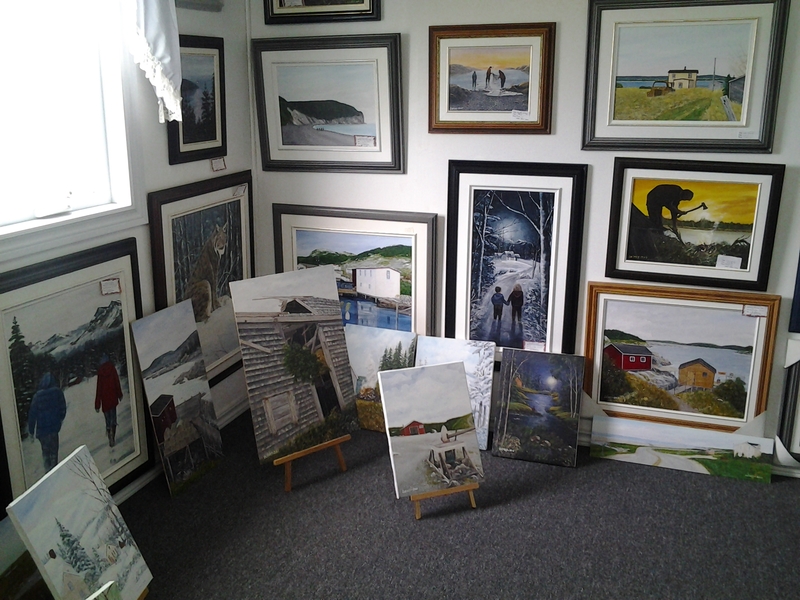 Again, we mismanaged our time by driving from Rose Blanche with stops in that area and to meet artist Jeff Musseau in Port aux Basques. A start in Stephenville or Corner Brook would be part of a better plan. 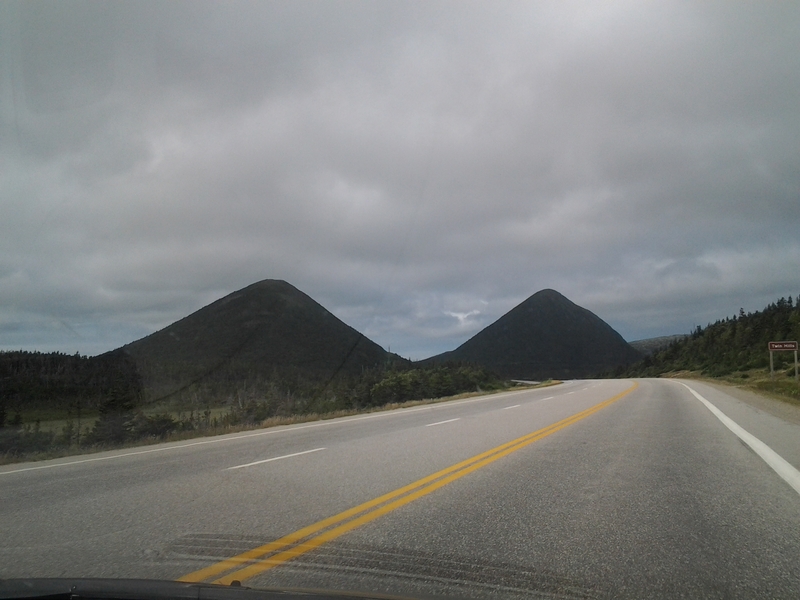 So many types of scenery in Newfoundland. Like our previous day going to Rose Blanche, we only had time for a glimpse of a lovely string of communities circling the peninsula. Alpacas are certainly not native or common here but seem to thrive in the farm. The animals in a variety of sizes and colours provided a nice distraction after a long drive. Alpaca wool was availabe for sale and many crafts from Peru with some Newfoundland sheeps wool knitting also for sale. 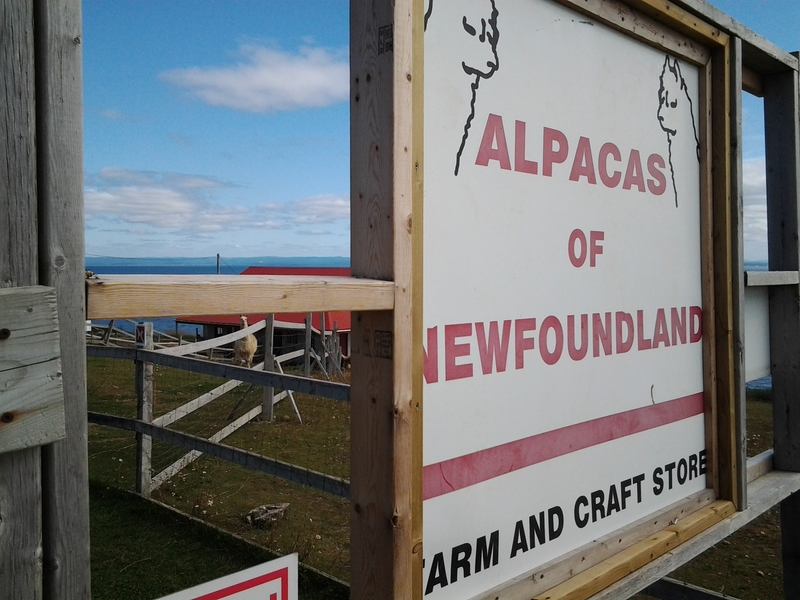 Newfoundland Alpaca farm is located on the ocean and an interesting stop on the Port aux Port peninsula. 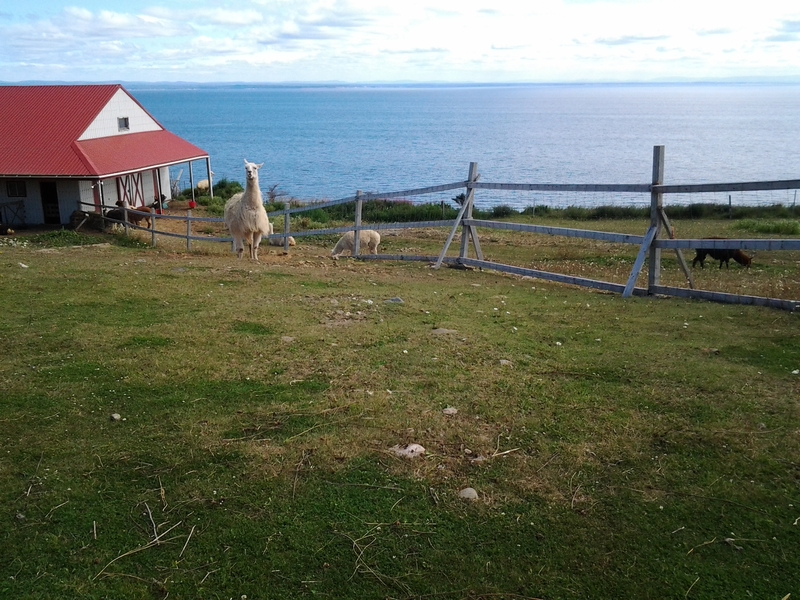 Ocean view at the Alpaca farm. At the local tourist information stop we got a map and some tips from three young girls employed there and their fourth friend, in for a visit. The girls provided a map with the attractions and communities marked. Their friend spoke up when I asked and suggested Hidden Falls in Sheaves Cove as an interesting place to stop. All of these girls were personable and helpful and happily took some tourist brochures from various places we’d seen this summer. Heading to Hidden Falls on the Port au Port peninsula. Sheaves Cove was indeed a beautiful stop as we worked out way to the Inn at the Cape in Cape St. George. 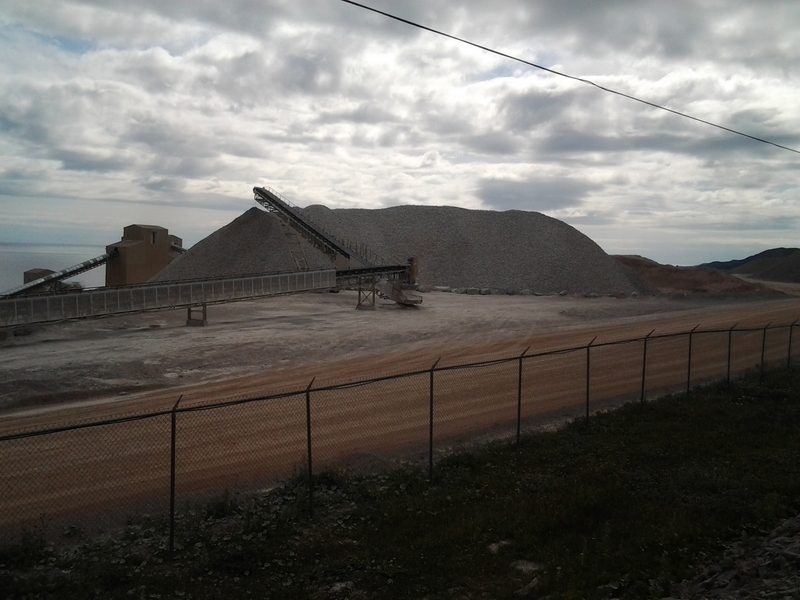 Along the way we came to a huge rock quarry with an amazing number of machines for taking rock to gravel and maybe beyond. I had to stop and take a few pictures for my science unit on Rocks in Gr. 4. 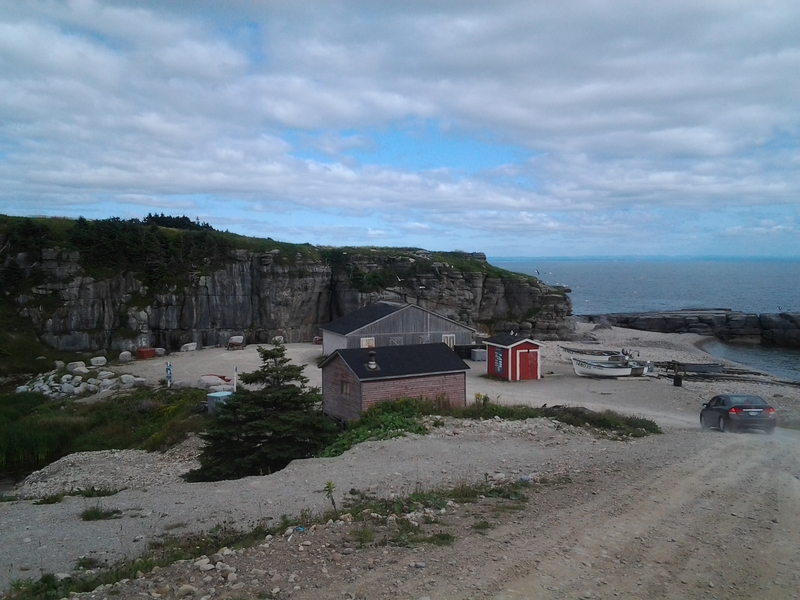 We eventually found Cape St. George and the Inn run by the Fenwick family. Rooms were large and comfortable and opened to a deck overlooking the water. 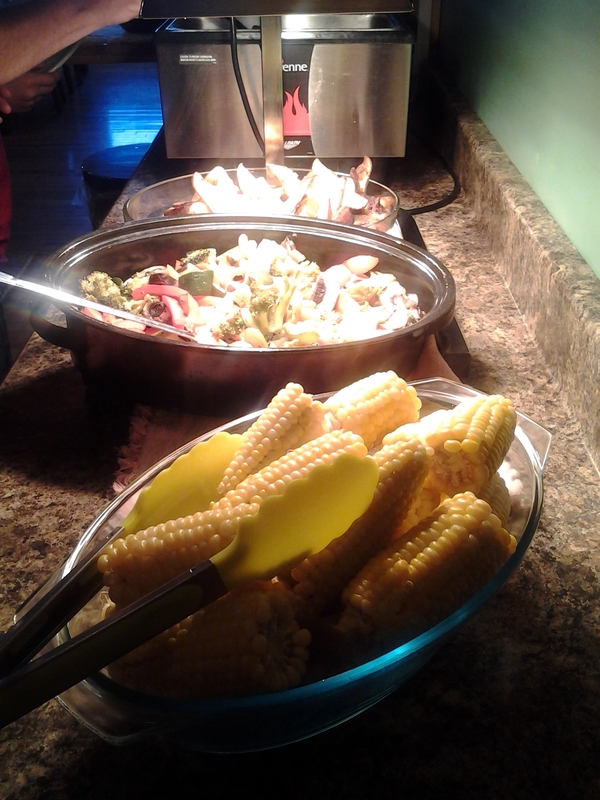 Dinner was included in the room rate and was an amazing buffet prepared by Peter`s son, Michael. With a variety of meats, casseroles and amazing salads we counted 19 choices on the menu including desserts. 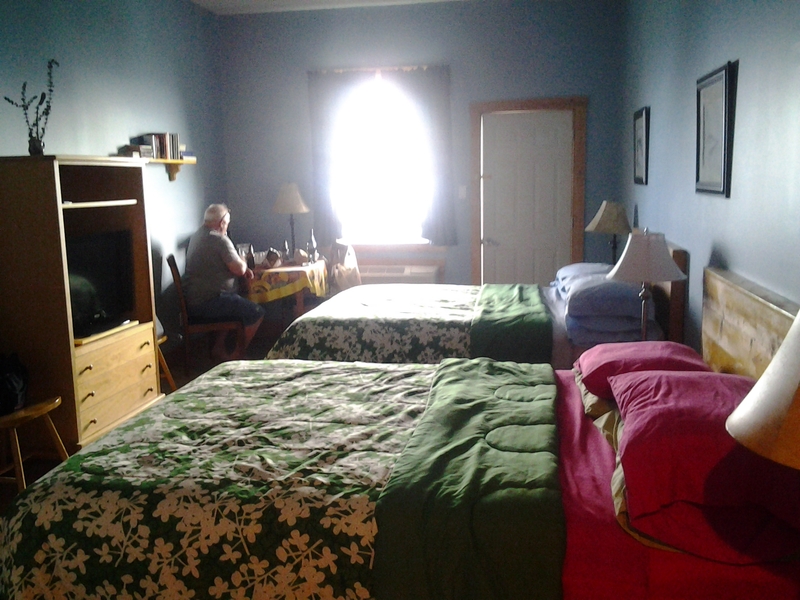 Our room at Inn at the Cape in Cape St. George. The door opens onto a large shared deck overlooking the ocean. Because only a small number of guests were in, the salads were prepared in small amounts but with such variety there was food left over. Fresh beets and cucumber salad were so refreshing after a summer of restaurant and road food. My favorite item on the menu was a peach and jumbo shrimp salad with Gorgonzola cheese. 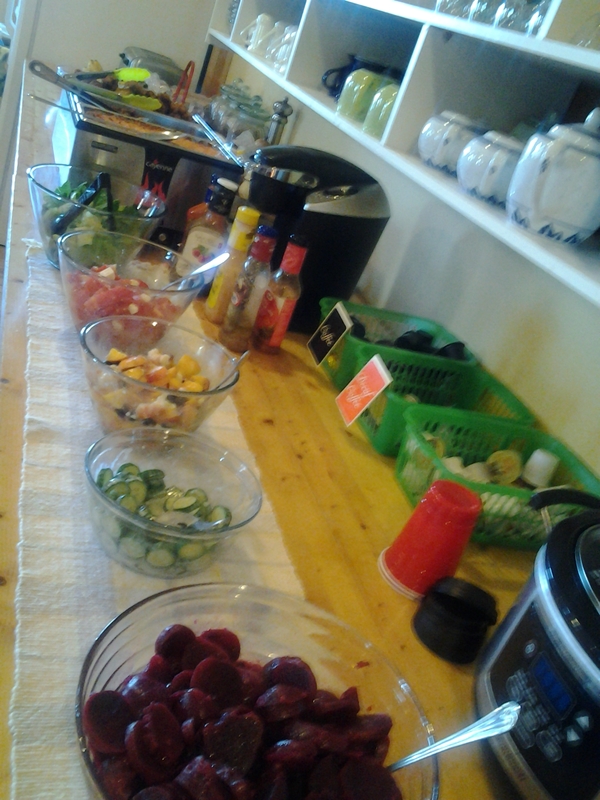 This is not a `fancy` place but all of the creature comforts are met in a very satisfying way. Breakfast was also buffet style with eggs prepared as you ordered them. Meals and lodging were included in the very reasonable rate. This is on our list of places to visit again and recommend without hesitation. I do like the interesting selection of Newfoundland art and books to enjoy. We continued around the Cape and realized there are many sandy beaches and places where we would have liked to have stopped if we`d planned better. Next time. 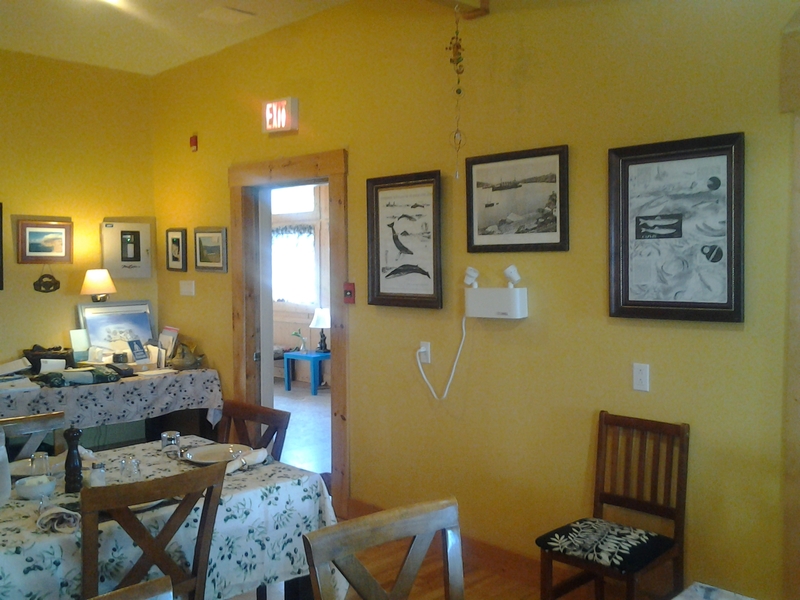 We found a lovely art gallery in Grand`Terre (Mainland). 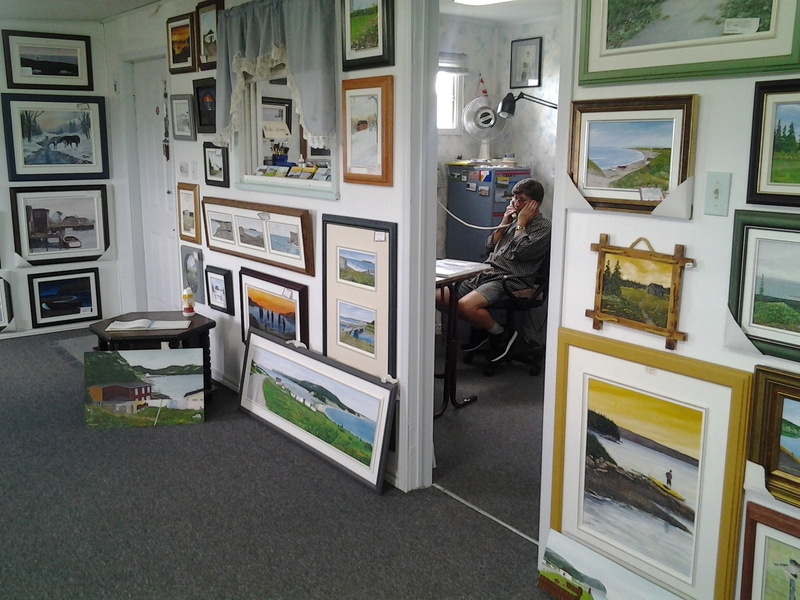 The artist, Mickeal Lainey was working quietly in his office as we browsed his original works ranging from 30 dollars to around three hundred or more. 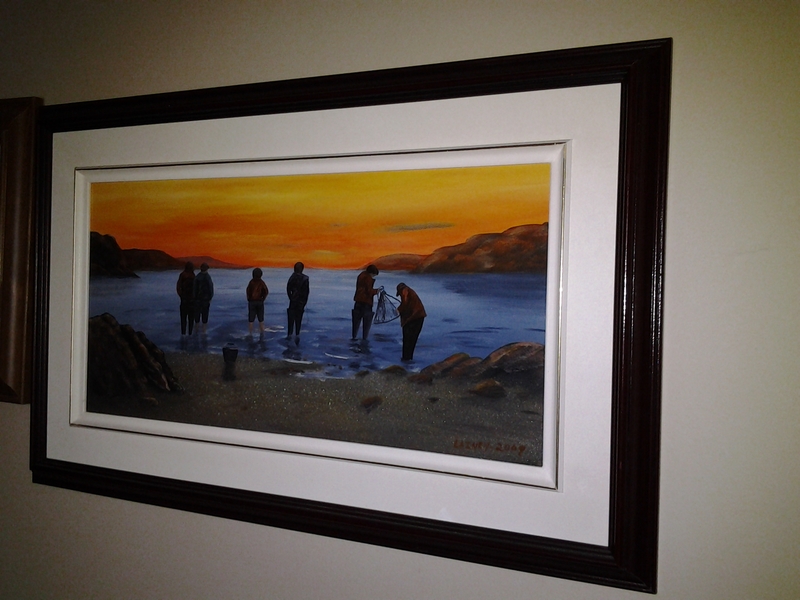 I`m usually the buyer but Leo really liked a picture showing capelin fishing. We ended up with a lovely souvenir of our first visit to Island Studio Art Gallery. 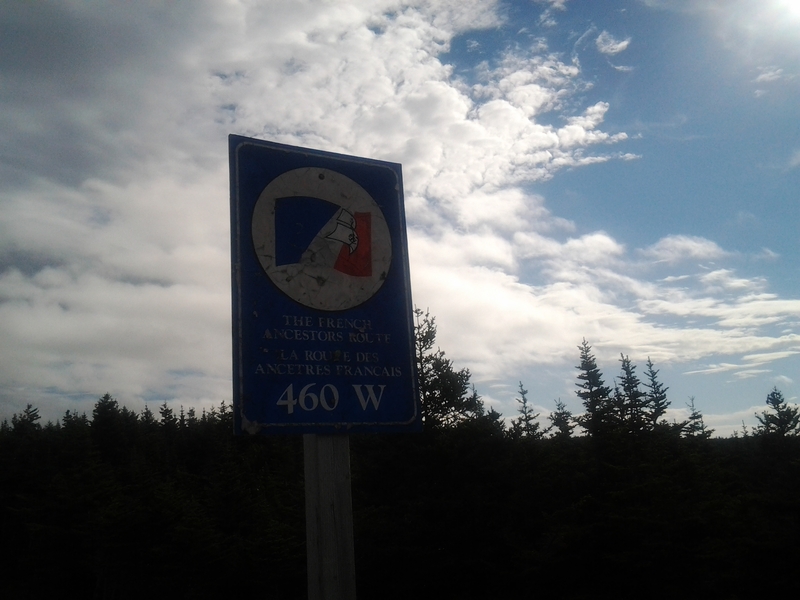 We did take a drive in Black Duck Brook and followed the road out onto Long Point. 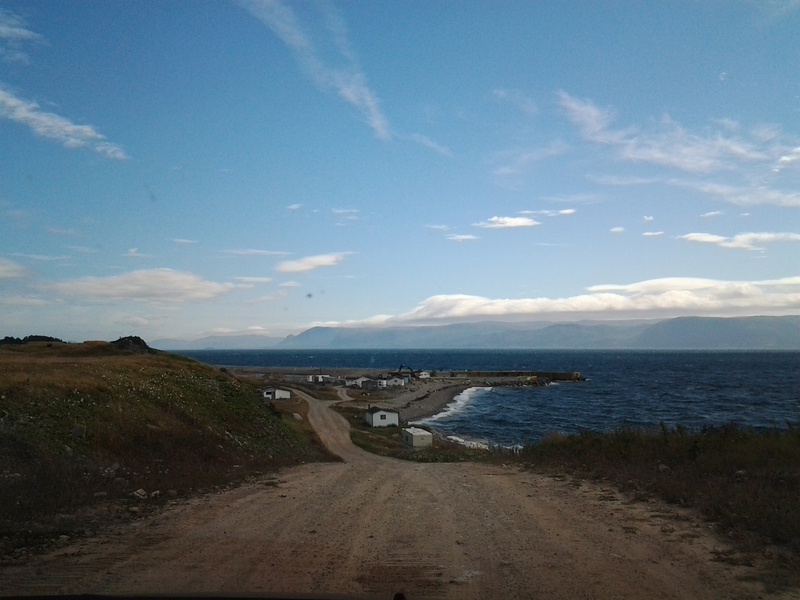 It was a long drive on a gravel road but the road was well cared for and as the land narrowed, we could see ocean on both sides of the road in some places. 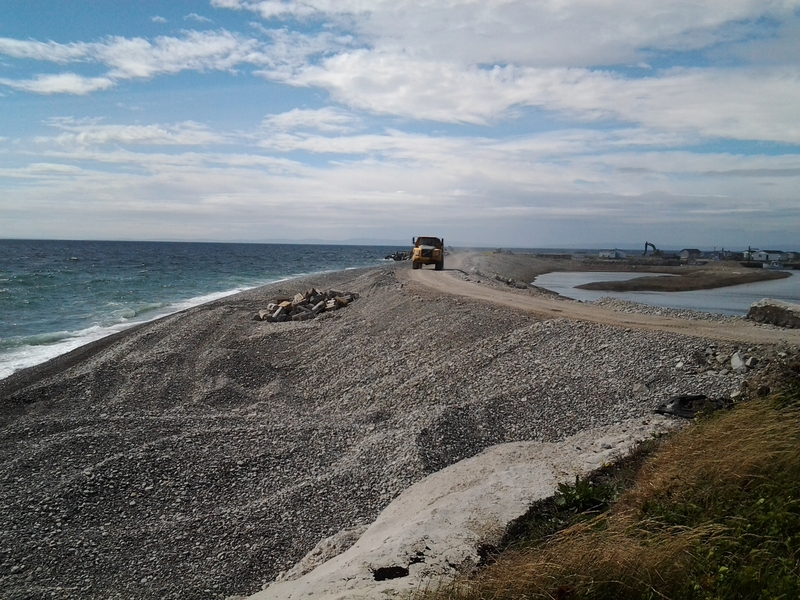 We were rewarded by beautiful views and realized the road maintenance was because a large breakwater was under construction at the government wharf at Blue Beach. 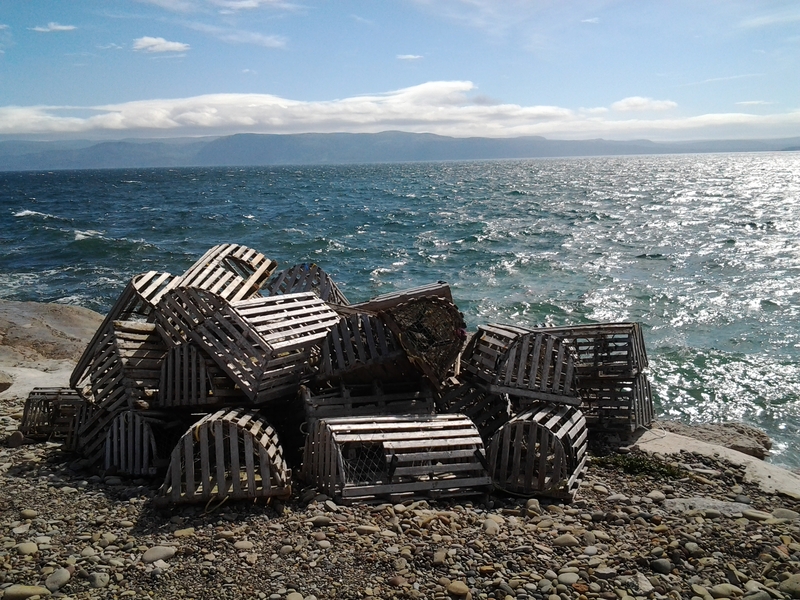 This was the end of a night in Corner Brook, one in Rose Blanche and then Cape St. George. We had a great tour of the new areas and have good plans of how to do it better the next time. A lovely holiday and a great souvenir of the summer of 2014. 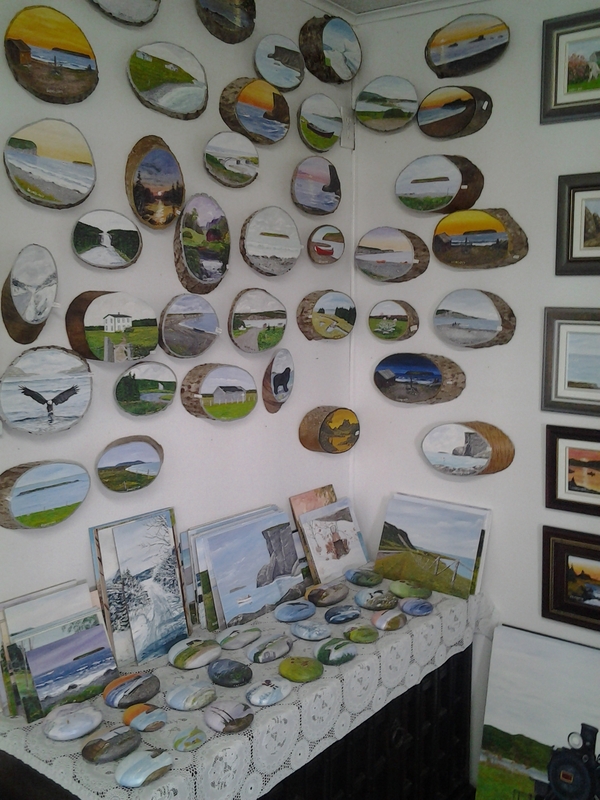 Travelled the same area June 2018 and just loved our stay at the ” Inn”, spectacular local scenery and the stop at the studio. Found your site just by chance after googling the artist’s name on a painting bought Are the studio. Definitely a place to visit again and suggest to others! Thanks for letting me re live this aspect of our NFLD trip last year!